Many CrossFit enthusiasts are stuck in a “macro rut.” They isolate proteins, carbohydrates and fat in their meals, which, though useful, can often become bland and boring, leading to burnout. Chef Nick Massie developed the concept of “functional food,” with which he teaches people how to build balanced recipes that are packed with flavor. His course takes the mystery out of meal prep and sets the foundation for turning you from a kitchen catastrophe into a Culinary Ninja. This fun, highly interactive one-day course covers culinary basics in a lecture setting with practical application in a kitchen setting. While batch cooking is the focus, nutrition math, chef’s tips and tricks, and food theory are also covered. Course participants will gain confidence in the kitchen and learn the basics of balanced recipe development—basics that apply directly to CrossFit’s nutritional foundation. Participants will leave with 16 self-prepared three-block meals, along with the knowledge and skills to continue their culinary journey. Batch calculations of recipes—how to develop and cook balanced recipes and bring efficiency to your meal prep. Nutrition math—calories-to-grams conversions, Zone-block calculations, macronutrient percentage calculations. Chef’s knife skills—how to hold a knife, ergonomic station set-up, basic cuts. Chef’s seasoning tricks—toasting spices, properly salting, dry versus fresh herbs, timing. Chef’s tips and tricks—how to maximize efficiency, how to minimize waste, kitchen do’s and don’ts. Chef’s food theory—working with heat, sweet, sour and salt. How to reduce sugar and fat by pairing these elements in a balanced manner. 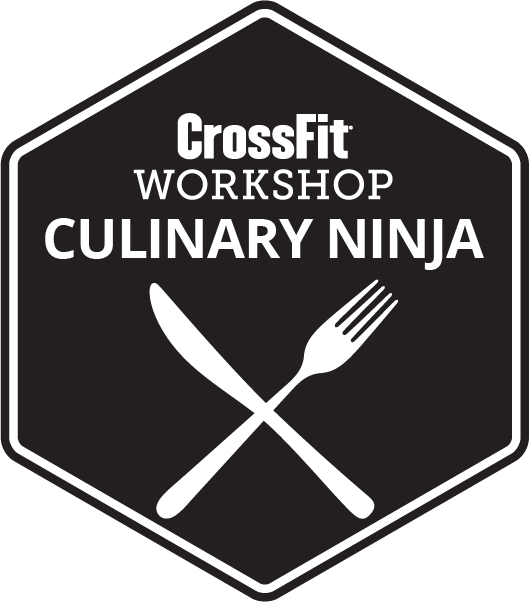 The default language for the CrossFit Workshop: Culinary Ninja is English. In some countries, a translator is provided. Lecture and small-group practical sessions are translated in real time. Courses with a translator are specified in the "Language" section from the event registration link. Generally, translators are used in Latin America and some countries in Europe and Asia. Upon successful completion of this course, a Certified CrossFit Trainer may claim eight CEUs toward his or her continuing education. All kitchen equipment will be provided. You need to bring a notepad, a pen/pencil, a water bottle, and a positive attitude! In addition, we recommend a cooler that will enable you to take your prepared meals home following completion of the course. You will have the option to purchase a Culinary Ninja kit while at the course, which will be shipped to your home the following week. It consists of the same equipment that we use in class. Those who attend the CrossFit Workshop: Culinary Ninja receive a Certificate of Attendance. Check back soon for course offerings. Please arrive at 8:30 a.m. to check in.